Mattis and Modi at the Shangri-La Dialogue set the direction of regional security and relations with China. One of the monikers that Mr James Mattis, the US Secretary of Defence, has been slapped with is that of "warrior monk" - a suitable epithet for a cerebral general who is also a legend in the fabled United States Marine Corps. One of General Mattis' famous quotes could well apply to his plenary speech at the 17th IISS Shangri-La Dialogue over the weekend: "Be polite, be professional, but have a plan to kill everybody you meet." On China, the Secretary was bold, but balanced. He said that Washington would cooperate with China "wherever possible", and support China's choices in the region if it supported long-term peace and prosperity in the region. But Mr Mattis also took on a colder and harder tone: China's militarisation of the South China Sea with electronic jammers, anti-ship missiles and surface-to-air missiles was tied to Beijing's strategy to use military assets for "purposes of intimidation and coercion". His comments drew a sharp retort from Lieutenant-General He Lei, the head of China's delegation to the security summit. Still, the force of the Sino-US exchange was blunted by the fact that the two men spoke at different times and at different locations during the dialogue. Many issues were also discussed, ranging from the Rakhine situation in Myanmar, cooperation in the Indian Ocean and the need for coordination in the fight against terrorism. And given that the dialogue occurred 10 days before the historic Trump-Kim summit, the US, Japan and South Korea were unanimous in stressing their desire for CVID - complete, verifiable, irreversible denuclearisation - of North Korea's nuclear arsenals. The finer point was that the Japanese and South Korean defence ministers took different perspectives on how to achieve CVID. Drawing on feedback from participants, Dr Ng Eng Hen, Singapore's defence minister, told reporters that the 17th IISS Shangri-La Dialogue was "one of the best". The statistics say it all - 561 delegates from 51 different countries attended, with a record number of defence ministers showing up, 13 of whom spoke in the bigger-scale plenary sessions. By far, the biggest theme to emerge was the discussion on the so-called Indo-Pacific strategy. A concept first raised by Japanese Prime Minister Shinzo Abe in the mid-2000s, the strategy seeks to link two vast oceans - the Indian Ocean and the Pacific Ocean - and mould them under the overarching principles of rule of law, maritime security and shared prosperity. Delivering the keynote last Friday, Indian Prime Minister Narendra Modi put South-east Asia and Asean at the centre of the Indo-Pacific, and said that the grouping's unity was critical to regional security. Echoing Mr Abe and former US Secretary of Defence Ashton Carter, who had spoken at the Dialogue in years past, Mr Modi said that all nations should have equal access to maritime and air spaces, and called for regional disputes to be settled under international law. Mr Modi has received some flak, particularly from the US, for not taking a harder line at a time when China's regional behaviour is becoming increasingly assertive. In particular, his focus on Asean centrality, and clear avoidance of the term "Quad" (a term referring to the loose grouping of Australia, Japan, India and the US, which has drawn much derision from Beijing) was singled out. That said, however, Mr Modi's approach is sublime. For one, Asean member states are already concerned with the dilution of the grouping's centrality; an over-emphasis on the Quad would have stoked these fears. In addition, avoidance of the term Quad enables India - and its other like-minded Quad partners - to fly under China's radar. Answering a question as to why the Quad was not mentioned, Mr Mattis replied, quite cheekily, that he had planned to use it in his seven-hour speech, only to cut the term out in order to trim down his delivery. Going forward, the Quad faces two challenges - offering a credible alternative to countries saddled with massive debt arising from their participation in China's Belt and Road Initiative as well as deterring China's militarisation of the South China Sea. On the latter, Lt-Gen He spoke up resolutely against Mr Mattis' comments on the South China Sea, trotting out well-worn rationale to explain China's build-up in the area. Speaking over 12 minutes in a smaller-scale special session on military capability developments in the Asia-Pacific, he insisted it was entirely within China's rights to deploy military assets there, for national defence and to pre-empt invasion. Lt-Gen He's comments belie the fact that China, despite its inherent advantages of having heavily-fortified bastions in the South China Sea, faces pressure. The Trump administration has conducted seven so-called Freedom of Navigation Operations (Fonops) in the South China Sea since January last year. 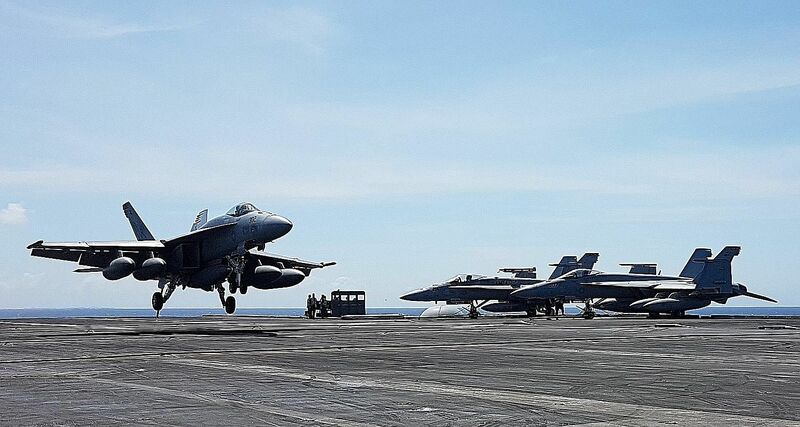 The most recent one in May was the first-ever Fonop involving two US Navy warships. US-style Fonops are in essence highly-technical legal instruments meant to challenge what Washington deems to be excessive maritime claims. They are not meant simply as displays of deterrence and military strength. In the past year, however, many countries - such as Australia, France, Japan and the UK - have stepped up what are called freedom of navigation-related patrols, which are exercises of high seas freedoms to strengthen the rule of law at sea. Speaking at the Dialogue, the French and British defence ministers announced that their countries would send their naval ships through the South China Sea this week to assert the shared right to freedom of navigation. It was regrettable that China was represented at a similar level as last year. Lt-Gen He is the vice-president of China's Academy of Military Science. In the 12 years between 2007 and last year, China's delegation was represented at the deputy chief of general (or joint) staff level eight times. That said, if Sino-American relations are the bellwether of the regional temperature, it could well be said that Sino-American interactions, though gut-wrenching in recent months, could well pave the way for a stabler regional order. Professor Thomas Schelling, the late Nobel Peace Prize-winning economist, said that strategic bargaining or coordination would typically lead two parties to come to a "resting place" where their expectations converge. Under this rubric, one could see a quid pro quo emerging on three fronts. If China stops further militarisation of the South China Sea, the US and its allies would stop Fonops and other freedom of navigation-related activities. China has endorsed North Korea's "phased and synchronous" - or gradual, action-for-action - process to achieve denuclearisation. The Trump administration, on the other hand, prefers a quicker process, with a timetable of between six months and a year. A quid pro quo would essentially split the difference. Lastly, the current Sino-American trade sanctions spat could be resolved if both sides met each other halfway and seek ways to enhance trade instead. At the Dialogue, Professor François Heisbourg , the chair of the IISS Council, noted that Secretary Mattis had at the 2017 Dialogue asked America's allies to "bear with us" as the Trump administration found its footing. Asked Prof Heisbourg: "How are you (Mattis) bearing up?" His reply : "I hate it when someone quotes me from the year before… I'm doing just fine, thank you. No problem." If the US and China manage to arrive at the quid pro quos, Secretary Mattis' answer will be pretty much spot-on. If not, one should expect more turbulence at next year's Dialogue. •The writer is a Shangri-La Dialogue Senior Fellow for Asia-Pacific Security at the International Institute for Strategic Studies, which organises the IISS Shangri-La Dialogue.